There’s a whole lot one can do with Photoshop these days to put your subjects into any environment we wish. But, for me, nothing beats the authenticity of shooting on location. It seems Ben Von Wong feels the same way. For his latest project he took his model, Tau, and crew out into the middle of Hawaiian lava fields. The project is part of Ben’s work to raise awareness for climate change, and to give back to those who have been victims of natural disaster. In this case, Hurricane Matthew. Assisted by lava expert and landscape photographer CJ Kale, ben and his crew set off for the Big Island of Hawaii to capture the shots. Fortunately for us, as well as fantastic images, Ben also created a behind the scenes video documenting everything that went into their production. Hawaii really is a photographer’s paradise. It’s filled with beautiful people, dramatic landscapes, brilliant night skies, and enough varieties of sea life to keep an underwater photographer busy for a lifetime. Given the diversity of Hawaii’s climate zones (there’s 8 of the world’s 13 climate zones on Big Island alone), we also get some pretty wicked weather. Over the weekend, I had the pleasure of visiting the Extreme Exposures Fine Art Gallery in Hilo, Hawaii where two photographers, Tom Kuali’i and Bruce Omori, display their work. Of course, all of the work gracing the walls of the gallery were eye-catching, and one photo in particular really stood out. The award winning photo has made its rounds on the internet and has even made its way into the Smithsonian Museum of Natural History. Seeing Bruce Omori’s “Volcanic Vortexes” in person (and beautifully printed on metal to boot) was even grander than one can imagine. Photographing lava is not for the faint of heart, but for some, standing away from an eruption is neither close nor epic enough. 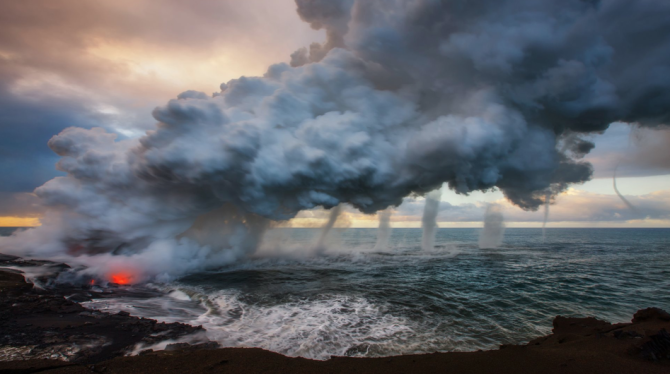 Photographers CJ Kale & Nick Selway, from Kailua Kona, Hawaii, takes this concept to the extreme taking photos of waves while engulfed with Lava.